Every once in a while, someone comes along and breaks the mold. In this case, it's a young man named Lesli. With a truly original voice and expression, he leaves no stone unturned with his versatile performance. Growing up in Sweden outside of Stockholm, this 26-year old had a colourful musical upbringing. With a father wh was an established musician, picking up the guitar was inevitable. His teenage years were spent as a frontman in various progressive metal bands, playing a countless amount of gigs at local clubs and venues. Growing up in Sweden outside of Stockholm, this 26-year old had a colourful musical upbringing. With a father wh was an established musician, picking up the guitar was inevitable. His teenage years were spent as a frontman in various progressive metal bands, playing a countless amount of gigs at local clubs and venues. He has also worked as a session guitar player, touring etensively with a swedish artist in Europe. In 2002, Lesli began to dismantle his career as a guitar player, choosing a life in musical seclusion. As a loner his songwriting flourished. Inspired musically bu the dynamic nuances of the steel string guitar, and lyrically by painful heartbreaks and a world in constand turmoil, timeless music took shape. As an independant artist, Lesli began playing clubs and bars in the capitol city. It wasn't long until rumours spread of his heartfelt performances, and Lesli began building a small dedicated fanbase. In spring of 2004, producer and former Warner A&R Manne von Ahn-Oberg (Stina Nordenstam Dunger) caught Lesli's live act. Impressed by his songs and vocal expression, he offered him a record deal with newly founded record label PublishMent. In june of 2004 a deal was signed and the creative collaboration between them started. From naked guitar n' voice recordings to over-the-top string and horn arrangements, the cound is kept acoustic and pure. Orchestral arrangements are written and conducted, by Mannes longtime friend and collaborator, the brilliant Jonas Nystrom. 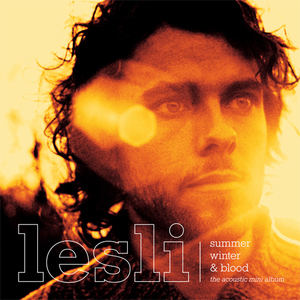 2005 will see the release of Lesli's first solo effort, Summer Winter & Blood - the acoustic mini album.